A bloody accident on Akure-Owo Expressway in Uso town, Owo Local Government Area of Ondo State has claimed no less than 10 lives. 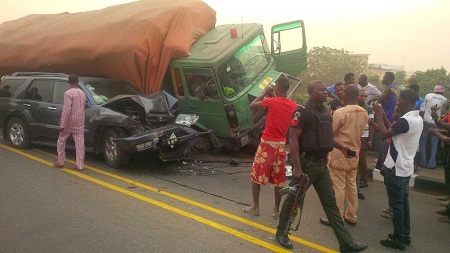 According to the Punch, no fewer than 10 persons lost their lives in a fatal auto crash on Akure-Owo Expressway in Uso town, Owo Local Government Area of Ondo State. The crash, which was said to have occurred on Thursday afternoon, involved a trailer with number plate LSD 438 XE; a Nissan Sunny taxi cab, marked AL 750 WWW, and a Mistibushi bus with number plate LQG 122 JD. According to an eyewitness, the trailer, which was heading towards Abuja, rammed into the two vehicles, coming from the opposite direction, while trying to avoid potholes on the road, killing 10 of the passengers of the vehicles. The eyewitness narrated that vehicular movement was disrupted for several hours as officers of the Federal Road Safety Corps, men of the state Police Command and officials of the National Emergency Management Agency battled to evacuate the victims from the affected vehicles. The truck drivers was said to have fled the scene after the accident, obviously for fear of being mobbed. Giving the details of the crash, the Head of Operations of the state Sector Command of the FRSC, Akin Adedipe, however, said four people died in the accident while 11 were injured. He attributed the accident to wrongful and dangerous overtaking by drivers of the vehicles involved. The sector commander explained that all the victims were rushed to the Federal Medical Centre, Owo, for medical attention while the dead were deposited in the morgue of the hospital. Adedipe, who warned motorists against dangerous driving and over-speeding during the festive season, said the command would not relent in its efforts to reduce road crashes.